What the other two also don’t know about Alonzo is that his armlessness is a ruse. He is a fugitive concealing his limbs (and incriminating double thumb) with a tight corset, a secret kept by his crony Cojo (John George). Cojo warns Alonzo that he must not allow Nanon to embrace him again for fear of her feeling his concealed arms. 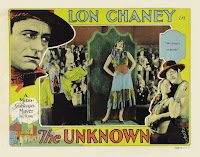 Chaney is very convincing as a latin-American gypsy, helped by his heavy features and rugged masculinity. His dexterity is also impressive in using his legs to manipulate objects such as a cigarette and a wine glass, albeit with occasional use of doubles. He keeps the character’s emotions bottled up, but we are allowed to see his yearning which grows more acute and uncontrollable as the plot unfolds. Knowing of Nanon’s phobia of being touched, it suddenly occurs to him to make a grisly sacrifice of his real limbs via blackmailing a surgeon into amputating them. “No…but I have lost some flesh”. Malabar boasts to Alonzo about his new test-of-strength stunt - holding the reins between two horses galloping in opposite directions on treadmills. If it should go wrong, Malabar cheerfully observes he would risk being torn limb from limb. At the prospect of this, Alonzo’s eyes flash with a macabre light worthy of the evil Hood in THUNDERBIRDS. During the act, in an effectively-staged show sequence by Browning, Nanon whips the horses into an increasing pace, oblivious to the inter-cuts of Alonzo sneakily sabotaging the treadmill speed. His plan to render Malabar as handicapped as he is scuppered by Nanon throwing herself in the path of one of the horses. Alonzo cannot bear to place her in jeopardy and sacrifices himself fatally under the animal’s hooved flailing. Thus the title card sums up that for Alonzo there is “…an end to Hate called Death and for Nanon an end to Hate called Love”. LONDON AFTER MIDNIGHT (1927). Otherwise known as THE HYPNOTIST this MGM release can legitimately be claimed as American cinema’s first vampire film, predating Universal’s DRACULA by four years, which makes it all the more tantalising that the film is one of the most sought-after silent movies in the world. 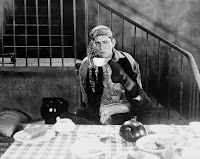 To place it in context, it came soon after the ground-breaking first ‘talkie’ THE JAZZ SINGER was released - at a time when silent film had already matured into a medium outgrowing the crude theatrical make-up exaggerating the eyes and mouths of its performers as well as reining in the actors’ emotions more subtly on camera. 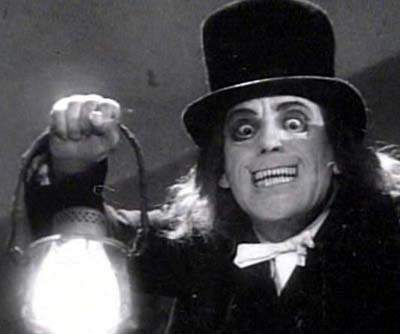 Ironically, in its star actor’s creation LONDON AFTER MIDNIGHT would not hold back on a level of startling make-up amplification to terrify audiences while still staying true to silent film technology. The story is reminiscent of an Agatha Christie whodunnit but with a definite horror emphasis. 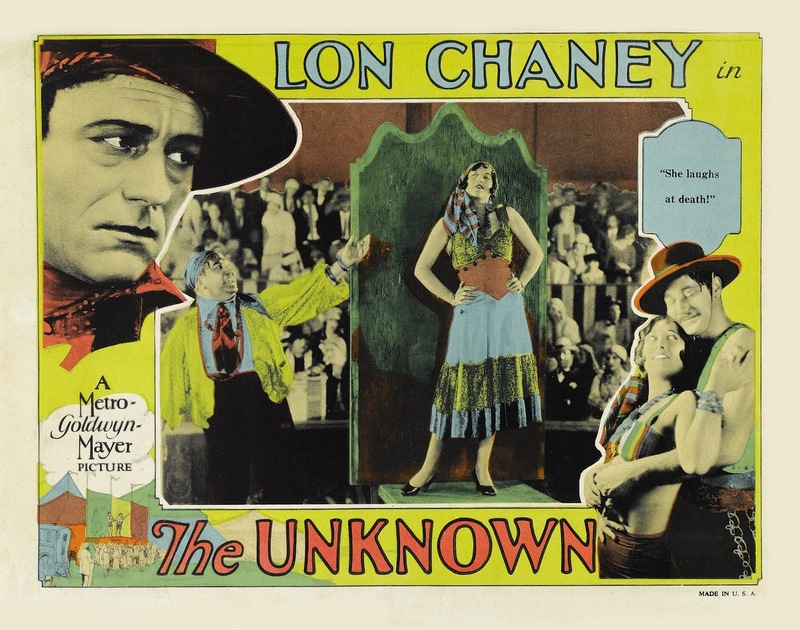 All we have to go on as evidence are an extensive collection of photos coupled with title cards in a welcome reconstruction by Rick Schmidlin for TCM’s movie channel , but we can see the depths of Lon Chaney’s commitment to character design. He has a dual role as Edward Burke, an intimidatingly frosty Scotland Yard Inspector and as a terrifying ‘vampyr’ (aka ‘The Man in the Beaver Hat’) who terrorises the supporting characters. The catalyst event is the death of the wealthy head of a family, Roger Balfour. We are meant to presume suicide as the victim left a note, however its brevity is intriguingly unsentimental to say the least: “I have taken my own life. Forgive me, Lucille”. Burke is required to interrogate each suspect’s movements and motives in classic murder-mystery style yet seems to accept this evidence at face value. Five years later, new tenants seem to have moved into the property. Ghostly apparitions are witnessed by Williams the butler and Smithson the maid (Percy Williams and Polly Moran): “’Oly ‘Enry! The bloomin’ ‘house is ‘aunted!” These are our first teasing shots of Chaney as the vampire figure, accompanied by a young pale female accomplice and a shocking sight he is. Top-hatted and caped as a gentleman, there the comparison with respectable normality ends. He crouches bestially in many shots, a lantern before him, all the better for us to see the demonic glare of his hard-gazing eyes almost penetrating the viewer’s mind. He achieved this effect with circular wire frames lodged into his eye sockets which were tightened before each take. In extreme close-ups the wires can just be made out; nevertheless it is a truly dreadful visage that in other photos looks out at us with heavy-lidded narcolepsy as if fresh-risen from the grave. This stunning look is augmented with an unnerving set of razor-sharp pointed teeth. Together, they are an unforgettable image, as though Mad Hatter comedian Jerry Sadowitz were spliced in a Fly-style scientist’s capsule with a killer shark. Photos of this character have haunted horror film fans like myself for decades for they are truly the stuff of vivid nightmares. “Vampires is what they are!” asserts Smithson. Burke has been brought back to reopen this cold case, as the ghouls seem to be linked to Balfour’s death. Mention is made that Roger’s body is no longer in his tomb, adding more spine-tingling speculation to the vampiric goings-on. Smithson is terrorised by a spectral visit in the main house by the vampire. Burke is thus persuaded by the frightening effects to change his verdict. He urges Balfour’s young nephew Arthur Hibbs (Conrad Nagel) to place his trust entirely in him and allow himself to be hypnotised. Burke tries to protect the house with “.a drawn sword of sharpest steel and a wreath of tube roses” around the entrance to daughter Lucy Balfour’s room. Ultimately, it emerges that Burke and the vampire figure are the same person, part of the detective’s labyrinthian plot to force Sir James Hamlin, a friend and neighbour of Balfour’s to reveal himself as the murderer. It’s perfectly possible that if ever unearthed, LONDON AFTER MIDNIGHT might prove a disappointment, particularly after so many decades of mouth-watering elusiveness and speculation. Contemporary reviews and accounts suggest it was not a classic film, citing Browning’s later remake MARK OF THE VAMPIRE (1935) starring Bela Lugosi and Lionel Barrymore as the better version. However, it was a huge box-office hit for its time, made on a very low relative budget of only $152,000. 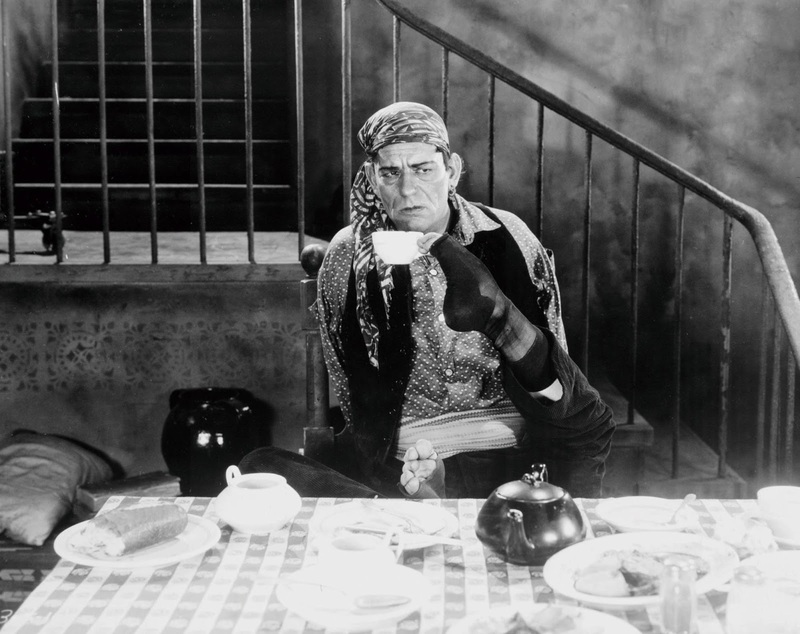 Moreover, what horror fan could resist another double-shot of Lon Chaney’s awesome versatility – not to mention finally seeing his Man in the Beaver Hat in full unsettling motion at last…?